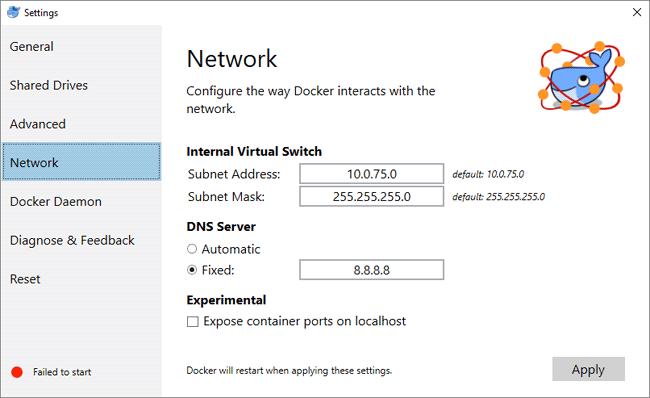 As in the documentation, it looks very easy, enable Hyper-V on Windows, download Docker msi and install it. But on developer machine, it is not so simple :) This post covers some issues and their solutions. Here you will get date-wise log files. Error: Unable to execute Stop: Failed to stop “MobyLinuxVM”: ‘MobyLinuxVM’ failed to change state. [22:36:51.236][ProxyProcess ][Debug ] com.docker.slirp.exe: ARP responding to: who-has 192.168.65.1? In Task Manager, Details tab, you can find the process with the PID. 3. 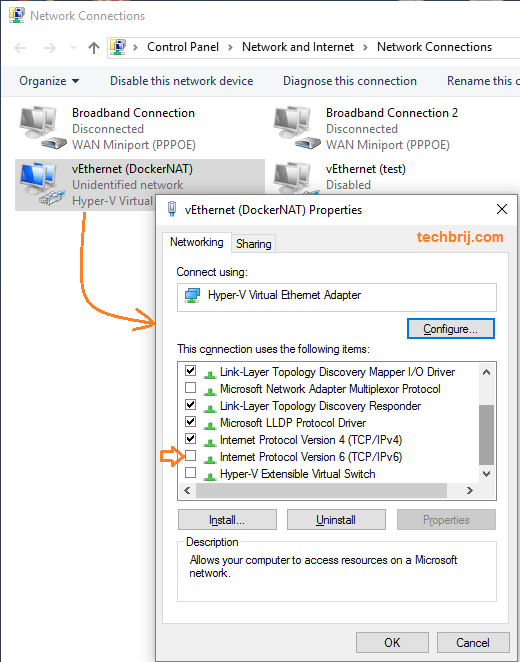 Remove/Disable all internal Hyper-v switches and other adapters (if you can). 4. 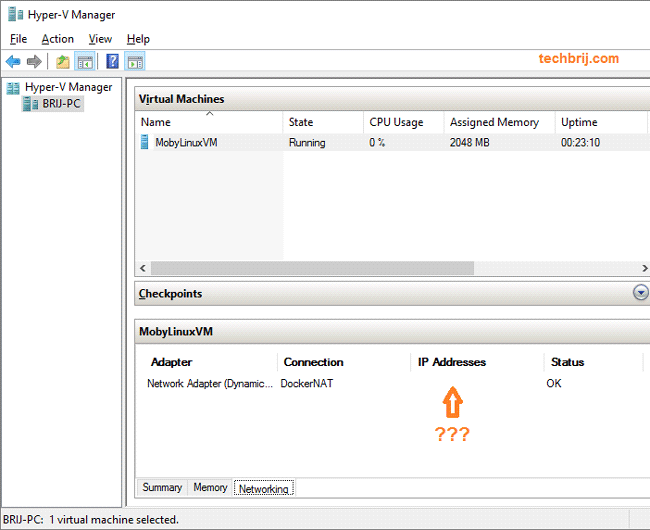 Remove all other Hyper V virtual machines except the Docker owned. 5. If an external USB Network adapter connected, remove it and use built in adapter. 7. In the Docker Settings > Reset > click “Reset to factory defaults..”. 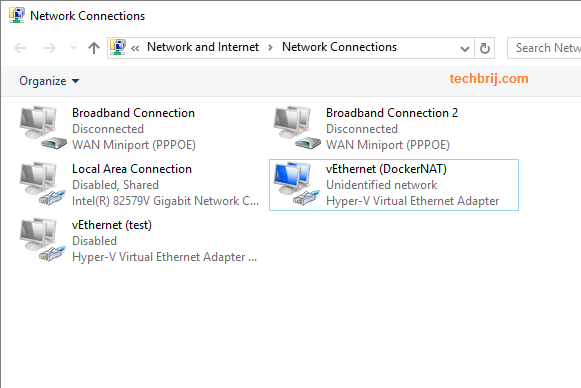 Open Hyper-V Manager, the VM is running but it doesn’t have an IP in the networking session. In the Docker Settings > Reset > click “Reset to factory defaults..” and try again. In the Run box(Windows + R), type eventvwr to open Event Viewer, In Windows Log > Application, check if any error message. Are you getting following WMI error? Event filter with query “SELECT * FROM __InstanceOperationEvent WITHIN 10 WHERE (TargetInstance ISA ‘Msvm_ExternalEthernetPort’) OR (TargetInstance ISA ‘Msvm_VmLANEndpoint’) OR (TargetInstance ISA ‘Msvm_SyntheticEthernetPort’) OR (TargetInstance ISA ‘Msvm_ComputerSystem’)” could not be reactivated in namespace “//./root/virtualization” because of error 0x80041010. Events cannot be delivered through this filter until the problem is corrected. On googling, I found the problem is due to network driver. Someone resolved by deleting the Intel 82579LM Gigabit Network adapter in the Windows Device Manager and reinstalling it with Windows default network driver. If you have any additional network driver installed, uninstall it and run it again. Note: Reboot is necessary to reinstall network drivers. You can get process id in the error details in Event Viewer and check the associated application for the process id in Task Manager. If it is different application, uninstall it and try again. In Docket settings > Network > Set DNS Server Fixed: 8.8.8.8 and Reset > Restart docker. Hope, It helps and saves your time. Do share your opinion to resolve the issue in comment box. How to get started with migrating from Windows Server 2003?